Last Saturday, April 28th, I had the pleasure of participating in an incredible workshop, “Creative writing for Foodies” in La Romana. Even though I’ve been writing for a while now, there’s always room for learning and improving. 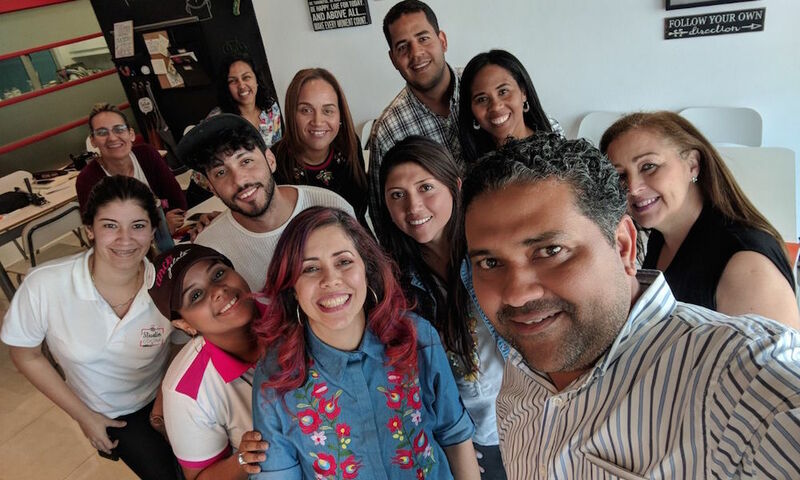 The workshop was run by Elaine Hernández Pión who is a Food blogger, gastronomic journalist, and the creator of BocaTips, and had Gabriella Reginato as guest special. 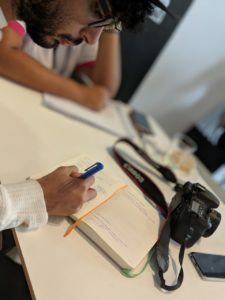 They provided us with the tools we needed to learn how to tell stories through gastronomic experiences and to have a different relationship with what we eat by being interested in its ingredients and how to describe and evoke different emotions in our readers. Starting at 9 am, we met at Gabriella Reginato’s Studio Cocina where the workshop took place. As soon as I walked in, I forgot all about being nervous. The space is set up for spending wonderful time together whether it be cooking, meeting with friends or learning something new. Elaine, her husband Juan, and Gabriella were there to welcome us and make us feel comfortable. They shared stories of how they met, how they started their business and how they each have followed their dreams working hard to get where they are now. Once all the participants arrived, we each got the chance to introduce ourselves and dove in on the material that Elaine had prepared. Gabriella, who was recently ranked as one of the top ten gastronomic influencers in the Dominican Republic, shared with us her social techniques and recommendations on the effective use of social networks like Instagram “You have to find your own voice when writing so that people recognize you”. This is the sixth edition of the workshop, which was held for the first time in La Romana. 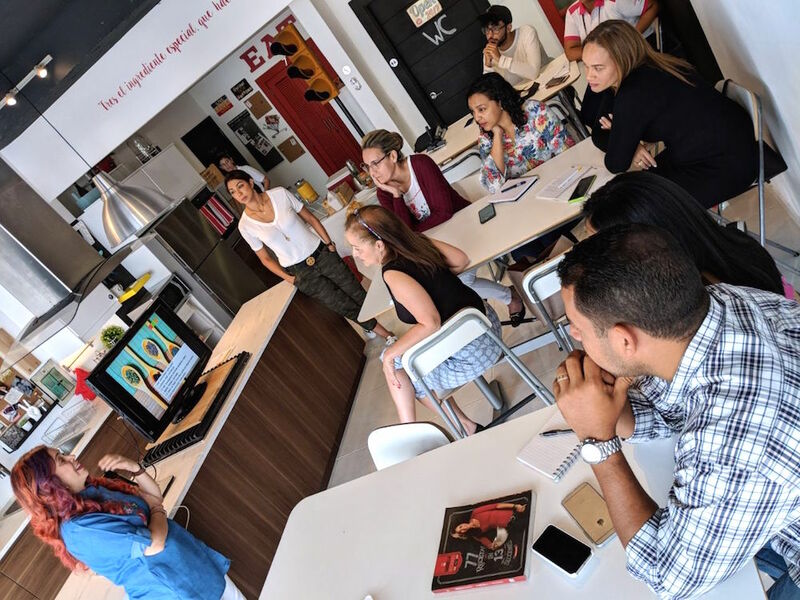 The program is focused on digital media and participants ranged from entrepreneurs, to influencers and communicators who offer gastronomic and tourist services in La Romana and Punta Cana. We learned techniques and tools to evaluate and describe using special language the products, dishes, destinations and gastronomic events, and how to communicate effectively on social networks and websites. The workshop was broken down into two parts. Elaine Hernández Pión, was in charge of the educational part of the program while the practical part, which consisted of the preparation of several sweet and savory tapas, was run by Gabriella Reginatto and Cinco Gelato. The objective of the “hands-on” exercise was to create micro stories inspired by the dishes that were served to us. For these stories we were to use narrative resources to describe the organoleptic characteristics of the dish, its ingredients, the place, and service received, all these being important elements to the creation of a gastronomic story – All to help awaken any type of feeling in the reader and connect with them on another level. “In a publication, the writing should not focus exclusively on the description of the gastronomic or tourist product itself, but in connecting with the emotions of the diner so that it can become a memorable experience. In addition to the providing the informative value of an event or gastronomic product, we must also make a description based on the presentation, the quality and freshness of the ingredients, as well as review the flavors, smells, textures and characteristics of the environment and the service we received”, stated Hernández Pión. This workshop is just one of many that Elaine and her husband prepare and they are exceptional! Not only will you learn something new, or reinforce what you already know, but it’s also a great opportunity to connect with people that share the same love you have for food and writing. They are already working on bringing another one to La Romana to follow on the success of this first one so we will keep you posted! You can also follow them on their social media as @bocatips and @platogrande. “Mexican Chic Soirée” with Idarmis and Lauren for this month’s Café de la Leche! This month live music at La Caña Restaurant!